We assessed the effect of physical effort with increasing intensity on the visuomotor processing in physically active young men (n=22). Subjects performed three 10-minute effort-tests with increasing intensity on a cycloergometer. Each participant was assigned individual workload values below the lactate threshold (40% VO2max), at the lactate threshold (60% VO2max) and above the lactate threshold (80% VO2max). Special Ability Signal Test included in the Vienna Test System (Schuhfried, Austria) was used to examine visuomotor processing. The numbers of correct reactions and the median reaction time as a measure of the speed of the detection process were analyzed. Four Signal test recordings were taken: pre-exercise and immediately after the three subsequent effort tests. The numbers of correct reactions increased after the first effort (40% VO2max) in comparison to the pre-exercise state and then significantly decreased after the third effort test (80% VO2max). In contrast, no significant changes in time of signal detection were observed. Physical effort with high intensity might disturb the visuomotor processing in accordance to the accuracy of the visuospatial differentiation of the relevant signal within irrelevant signals. 1. Ando S., Kimura T., Hamada T., Kokubu M., Moritani T., Oda S. Increase in reaction time for the peripheral visual field during exercise above the ventilatory threshold. European Journal of Applied Physiology. 2005;94(4):461-467. 2. Arcelin R., Delignières D., Brisswalter J. Selective effects of physical exercise on choice reaction processes. Perceptual and Motor Skills. 1998;87(1):175-185. 3. Brisswalter J., Collardeau M., René A. Effects of acute physical exercise characteristics on cognitive performance. Sports Medicine. 2002;32(9):555-566. 4. Brisswalter J., Durand M., Delignieres D., Legros P. Optimal and non-optimal demand in a dual-task of pedaling and simple reaction time: Effects on energy expenditure and cognitive performance. Journal of Human Movement Studies. 1995;29:15–34. 5. Chmura J., Krysztofiak H., Ziemba A.W., Nazar K., Kaciuba-Uscilko H. Psychomotor performance during prolonged exerciseabove and below the blood lactate threshold. Eur J ApplPhysiol Occup Physiol. 1998;77(1-2):77–80. 6. Chmura J., Nazar K., Kaciuba-Uscilko H. Choice reaction time during exercise in relation to blood lactate and plasma catecholamine threshold. International Journal of Sports Medicine. 1994;15(4):172– 176. 7. Cian C., Barraud P.A., Melin B., Raphel C. Effects of fluid ingestion on cognitive function after heat stress or exercise-induced dehydration. International Journal of Psychophysiology. 2001;42(3):243–251. 8. Clark C.R., Geffen G.M., Geffen L.B. Catecholamines and the covert of attention in humans. Neuropsychology. 1989;27(2):131-9. 9. Davranche K., Audiffren M. Facilitating effects of exercise on information processing. 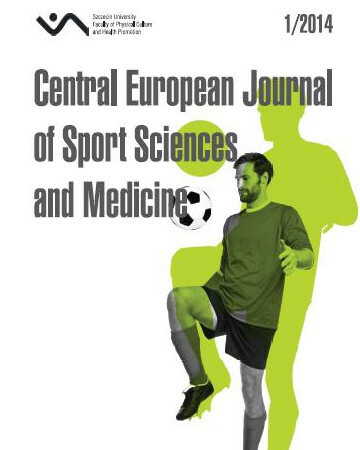 Journal of Sports Sciences. 2004;22(5):419-428. 10. Davranche K., Burle B., Audiffren M., Hasbroucq T. Information processing during physical exercise: a chronometric and electromygraphic study. Experimental Brain Research. 2005;165(4):532-540. 11. Edg E.J., Bishop D., Hill-Haas S., Dawson B., Goodman C. Comparisonof muscle buffer capacity and repeated-sprint ability of untrained, endurance-trained and team-sport athletes. European Journal of Applied Physiology. 2006;96(3):225–234. 12. Hasbroucq T., Tandonnet C., Micallef-Roll J., Blin O., Possamai C.A. An electromyographic analysis of the effect of levodopa on the response time of healthy subjects. Psychopharmacology (Berl). 2006;165(3):313–316. 13. Kamijo K., Nishihira Y., Hatta A., Kaneda K., Wasaka T., Kida T., Kuroiwa K. Differential influences of exercise intensity on information processing in the central nervous system. Eur J App Physiol. 2004;92(3):305-311. 14. Klich S. Fatigue development mechanisms during increased intensity exertion. Centr Eur J Sport Sci Med. 2013; 1: 39-45. 15. Lambourne K., Tomporowski P.D. The effect of exercise-induced arousal on cognitive task performance: A meta-regression analysis. Brain Research. 2010;1341:12–24. 16. Luk’janowa L.D. Bioenergetic hypoxia: definition, mechanisms, and methods of correction. Biull Eksp Biol Med. 1997;124(9):244-54. 17. McMorris T., Graydon J. The effect of exercise on cognitive performance in soccer specific test. J Sports Sci. 1997;15(5):459-68. 18. McMorris T., Sproule J., Delves S., Child R. Performance of a psychomotor skill following rest, exercise at the plasma epinephrine threshold and maximal intensity exercise. Perceptual and Motor Skills. 2000;91(2):553-62. 19. McMorris T., Graydon J. The effect of incremental exercise on cognitive performance. International Journal of Sport Psychology. 2000;31(1):66-81. 20. McMorris T., Hale B.J. Differential effects of differing intensities of acute exercise on speed and accuracy of cognition: A meta-analytical investigation. Brain and Cognition. 2012;80(3):338–351. 21. Royal K.A., Farrow D., Mujika I., Halson S.L., Pyne D., Abernathy B. The effects of fatigue on decision making and shooting skill performance in water polo players. Journal of Sports Sciences. 2006;24(8):807-815. 22. Tomporowski P.D., Ellis N.R. Effects of exercise on cognitive process: a review. Psychol Bull. 1986;99(3):338-46. 23. Tomporowski P.D. Effects of acute bouts of exercise on cognition. Acta Psychologica. 2003;112(3):297-324. 24. Voss M.W., Kramer A.F., Basak C., Prakash R.S., Roberts B. Are expert athletes “expert” in the cognitive laboratory? A meta-analytic review of basic attention and perception and sport expertise. Applied Cognitive Psychology. 2009;24(2):812–826. 25. Wilmore J.H., Costill D.L. Physiology of sport and exercise. Human Kinetics, USA 2004. 26. Yagi Y., Coburn K.L., Estes K.M., Arruda J.E. Effects of aerobic exercise and gender on visual and auditory P300, reaction time, an accuracy. European Journal of Applied Physiology. 1999;80(5):402-408. 27. Zwierko T., Czepita D., Lubiński W. The effect of physical effort on retinal activity in the human eye: rod and cone flicker electroretinogram studies. Graefe's Archive for Clinical and Experimental Ophthalmology. 2010;248(5):659-666.